The Federal Reserve is inclined to raise interest rates higher than otherwise if the next president pursues a more stimulative fiscal policy. Once again, market monetarists have known all along what the media is just beginning to discover—just as with negative interest rates. Congress has been whining about low rates for years. And now were are told that if the Fed raises rates to 1% or 2%, Congress will start complaining about high interest rates? BTW, the entire premise of the article is wrong. Fiscal policy will not have much impact on interest rates, because rates mostly depend on NGDP growth, and the Fed isn’t going to let that rise above 3% on any sustained basis. Hillary and Trump aren’t going to give us growth, they are going to deliver big government. 1. Trump has threatened to sue people on at least 20 occasions since the campaign began. 2. The ABA prepared a report on Trump’s excessive litigation, which called Trump a “libel bully“. But the ABA refused to release the report . . . (and this is not a Onion joke) . . . for fear of being sued by Trump. 3. Trump praised Hillary as a great senator and a great person. Said Bill was a great president. But don’t worry Harding, that was back in 2008, when he was not running for president and was free to speak his mind. I’m sure his views since he had to begin kowtowing to the alt-right are much more representative of his actual beliefs. For all their sharp differences, supporters of Hillary Clinton and Donald Trump have one thing in common: election-related stress. Nearly half of all likely voters in the ABC News tracking poll, 46 percent, describe the election as a source of stress in their lives, including roughly equal numbers of Clinton and Trump supporters. Nearly a quarter, again among both candidates’ camps, say the stress is serious. Wow, get a life. I wish politics were all I had to worry about. This entry was posted on October 25th, 2016 and is filed under Fiscal policy, Trump Derangement Syndrome, Uncategorized. You can follow any responses to this entry through the RSS 2.0 feed. You can leave a response or Trackback from your own site. -I supported Hillary Clinton in 2008 (on the Democratic side; Ron Paul on the GOP side) because I thought she’d be a good president (or at least, a better one than Bush), too. The big issue at the time was the Iraq war and the Bush legacy, and both were opposed it and desired to bring back happier days. Clinton even voted for the Iraq War, so I thought she learned from her mistakes. Now, I’m outright scared at what an insane person she is and that half the country thinks she’s even remotely competent on foreign policy. From Her post-2008 record, it is clear this woman is insane, trigger-happy, and cannot be trusted with nuclear weapons. Trump, meanwhile, can be. So this video tells me nothing more than that Democrats disgusted with the Bush legacy should vote for Trump, and that Trump is just a guy like me, with common sense and a clear understanding of success and failure. -I carved a pumpkin to take my mind off my rapidly growing election stress. See my blog. This is not a mere election. This is a struggle for existence. Trump never kowtowed to the alt-right, the alt-right (which was fully formed by late 2014) kowtowed to him. -You really think neither is gonna pressure the Fed to give them good monetary policy? You are so naive. @Harding: if Clinton is an existential threat shouldn’t you be taking her out, maybe with a suicide attack? If not aren’t you just being selfish? You have a chance to kill Hitler and you are carving pumpkins?! -Clinton is Her own worst enemy in this race. Taking Her out would be replacing Her with a much more electable candidate, potentially just as bad. Also, I’d like to smell the roses b4 we all die. Judging from the many blog posts from you about Trillary and Hump I assume that there’s an emotional side on your part as well, or not? One reason I almost never ban commenters is I want the world to see what politics does to people. The hole in this theory might be that most commenters here are nameless unknowns, so they couldn’t care less while you are not a nameless unknown, so people mostly see what politics does to you, or not? I find this election stressful: one of these two awful people will be the next president. And I have a life. Indeed, it’s because I have a life and value life, of others and me, that I do find it stressful. @Harding: So Tim Kaine is an existential threat too? Do go on…. @David: This will pass when you realize it doesn’t matter much to your day to day life, nor that of others like you, who is president. @Harding: I find your ideas fascinating and would like to subscribe to your newsletter. Read my blogs more often. @Harding: what if I already read every word of your blog, but I still want more insights from you? @Harding: I’m not on Twitter, I guess I will have to wait for your comments here. Also, in North Carolina, the GOP is winning by a lot at in-person absentee voting, which more than makes up for its extreme weakness at vote-by-mail. Dems blame this on voter-suppression efforts focused against Blacks. “rates mostly depend on NGDP growth, and the Fed isn’t going to let that rise above 3% on any sustained basis.” I would just submit that since the recession ended the average of GDP & GDI has been running at an annualized rate of 3.8% (data as of Q2). So, we’ve crossed the 3% benchmark for quite a while already. Lots of luck pressuring Yellen. Unless rolling on the floor laughing counts as an emotion. David, There are 1000s of awful things in the world. Most far more awful than this election. I can’t even imagine being stressed out by everything in the news. Yes, intellectually I know it’s important. But so is drug legalization and kidney market legalization and ending the war in Syria. But I can’t get stressed out over everything wrong in the world, or I’d go crazy. Maybe I’m just lacking in empathy, but I believe I’m not alone. The recent election of Duterte in the Philippines was much worse than Trump, in a country of 100 million people. I was disappointed, but I didn’t lose sleep over it. I’m resigned to the fact that the next president will likely be worse than Obama. But that’s a first world problem, not like Aleppo. Life goes on—the NBA season starts tonight!! Neil, The key is “sustained basis”. You can’t just look at growth during a period of falling unemployment. The trend rate is the rate when unemployment is stable—and that’s around 3%. What has NGDP growth averaged since early 2008, when unemployment was also about 5%? TravisV, Thanks, I think Barro overdoes it a bit. There are people who favor supply side economics for reasons other than paying less taxes. Like his dad. But yes, the populist conservative media is awful, and does not care about the truth. -The presidential election has a huge effect on all these. -Who do you think is funding those militant Islamist terrorist forces around Aleppo? That’s right. Also, my pumpkin was vandalized just today by some unknown, while everybody’s near me were left intact. We need to be tough on crime! Hillary will be soft on crime. Trump will be tough! As for first world problems, I would guess that elections in the third world are considerably more stressful than this one. Poor E. Harding is taking this Trump loss personally, he’s self-destructing. Why will conservatives assume that bringing in a public option will make government expenditures go down? I’d think it would be similar to the higher education market which also has a public option and isn’t known for being great at containing costs. E.O.Wilson : ” We humans are strange chimera. We retain our ancient tendency to take care of ourselves and our families, often in ways that are perceived by society as selfish or illegal. At the same time, group selection has given us a completely different sense of ourselves and our group. This sense is powerful enough in us to allow us to be virtuous, to have a sense of morality, and even of honor. For that reason we tend to lavishly honor those who sacrifice themselves, or commit parts of their lives to the survival and/or improvement of the group, even at some obvious cost to their own welfare. But the thing that is really new here, new in the science of it, is that humanity seems permanently suspended in the middle. If we went all the way to selfish behavior then the society would dissolve. If we went all the way towards altruism, where everyone is sacrificing and all we did was to think about the group, then we’d become more like ants, and we don’t want to be that way. So it seems that our fate is to hang in balance, in compromise and work out morality and a sense of honor as being something in between the well-being of the individual and well-being of the group. Philosophers and moral theorists have never understood this conflict, and that’s why they’ve never been able to come up with a sound theory of ethics, and have only come up with one-sided and incomplete explanations. Harding, over the past year+ I’ve accused you multiple times of being a determined troll and you’ve always vehemently denied it. But now you’ve overplayed your hand! Well done, I have to say, you really had me going for more than a year now. E harding… For most folks Cognitive dissonance is painful and disorienting. It places great pressures on the sufferers to reduce the dissonance, by avoiding situations and information that shine a spotlight on the dissonance. Screw you, Tom. Laughing over my misfortune. What, are you denying my pumpkin was vandalized? It was, just today, by some vandal I didn’t see. He needs to be locked up! The ABA is afraid of lawsuits and so stifles a report?! Egads. After Trump loses, I hope Sumner turns his guns on the American legal system. If the ABA is intimidated by the expense of our courts…then what hope for any ordinary person or clutch of people? We have a judicial system or a shakedown industry? “Zero fiscal multiplier” isn’t correct. One could say “zero fiscal multiplier conditional on the actions of the central bank” but that’s just as silly because it should be noted the reverse is also true. By the same logic, a “zero monetary multiplier” would be true if lawmakers changed ‘G’ in response to the central bank’s actions (yes, this is an extreme hypothetical which ignores all of the lags plaguing fiscal policy). I suggest sticking with “monetary offset” – sure it may be merely semantics, but the public is confused enough about these issues as is. Put a STOP to the scourge of pumpkin crime NOW!! Personally, I couldn’t disagree more with the case that I think Simon Wren-Lewis made a while back: that a central bank with an inflation, rather than NGDP level target, wouldn’t offset unexpected changes in fiscal policy. It’s hardly “sabotage” as much as it focusing on its forward-looking mandate which is, you’ve rightly noted, implicitly NGDP. I’ve always thought that *maybe* fiscal spending could boost productivity, and thus I’m somewhat more open to it, but we’re for the most part completely in agreement on this subject. What means this word, “election”? @Fred – you said “I’ve always thought that *maybe* fiscal spending could boost productivity” – so bridges to nowhere boost productivity? I guess this raises a genuine issue though, to me fiscal spending is really spending that is done only to raise aggregate demand, so it is by definition bridges to nowhere. Bridges to somewhere, i.e. bridges that actually repay their investment are not fiscal projects, they are simply projects. They have a positive return and therefore should be funded. This idea that there is a wealth of unfunded projects sitting out there which have positive returns bothers me – can there really be dollar bills sitting on the sidewalk that investors and governments are ignoring? Of course proponents of these projects who will benefit from them may argue such, but is it really true? Trumpkin and Pumpkin sound almost alike, and both have a radiant orange glow. So it’s not surprising that the Trumpkins get lit, while the Pumpkins get punched in the nose. Years ago, the sleazy tenants were in outer boroughs, but today they are mostly in Manhattan penthouses. I bet you will find many of Hillary’s Middle Eastern and Wall St donors in penthouses in the newest construction. Trump Tower people, in contrast, mostly stole their money a generation ago. Prof. Sumner, thanks for pointing out the relation between fiscal multiplier and monetary offset. You raise a good point: perhaps “stimulus” is the wrong word, because that comes with the obvious visual of paying people to dig ditches to fill them up in again, which would only be stimulative in the absence of an independent monetary regime. What I had in mind was mainly jobs training programs or something of that nature, i.e., to lean against hysteresis effects, but there is some literature I’m aware of suggesting that returns to infrastructure are far higher today than they’ve been historically (which isn’t too surprising; just look at its condition). I think there’s certainly a very real possibility that Congress, plagued by gridlock and threatened by the rise to power of an honest-to-goodness demagogue, is either unaware of these possible projects or wouldn’t dream of funding them for fear of bucking the “lame duck” convention. It’s possible Prof. Sumner is right, and I’m being way too optimistic, or even that I’m wrong in elevating hysteresis as much I tend to do. But, even if such projects were to exist, I hardly thing governments in their current form would even move a muscle. Fred – maybe I just a hopeless pessimist, but my experience in business is that the further you get away from any bottom line accountability, the less chance there will be of any spending being effective. For instance, in the example you present, that of training of people in new skills, how would measure the effectiveness of the people running the program? The private sector for instance will learn very quickly how much learning and inherent skills are needed in a job and very quicky look to ways to reduce this to get the maximum productivity out of their employees. A company that is dedicated to training people on Government money is not going to have this incentive and I believe if you actually could measure would likely be productivity destructive not additive. I also believe the arguments on infrastructure are also not as strong as people make out. Most arguments seem to be around repairing bridges, building new railways and upgrading airport terminals. But we rarely see any bridges in the US failing suggesting the current maintenance regime is fine (and when we do, it is usually due to external damage – https://en.wikipedia.org/wiki/List_of_bridge_failures#2000.E2.80.93present), railways are very expensive and inflexible when compared with existing perfectly acceptable solutions such as buses for short journeys and planes for long term, and airport terminals are working fine even if they are ugly. So again, I just don’t get that there are projects sitting there ready to go that will actually return their investment. Or is it after? 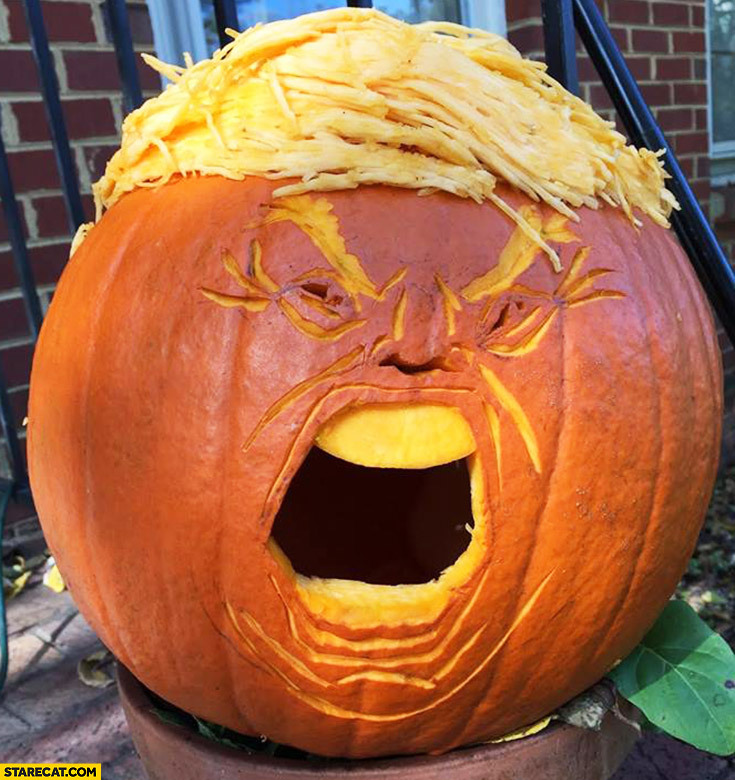 I have to say Trump’s orange face is perfect for a Halloween pumpkin. I googled more examples and they all look marvelous. Screw you, Tom. Laughing over my misfortune. What, are you denying my pumpkin was vandalized? It was, just today, by some vandal I didn’t see. It’s called Schadenfreude, isn’t it. Harding, are you now a part of the modern whining culture as well?! I can’t believe it. Stop the whining already. I looked up “first world problem” (more like zero world problem) in the dictionary. Wanna know what I found? A picture of you and your stupid pumpkin. I think that the ways that the Fed would prevent such a rise in NGDP growth would be likely to result in interest rates higher than they would otherwise be. Hence, fiscal policy would impact interest rates – by spurring the Fed to act. Harding, You’ve descended into parody. rtd. Suppose the effect is offset by private investors (crowding out). In your view, would that impact the fiscal multiplier? Travis, They haven’t bought me. Brent, That’s the liquidity effect. But over time the income and Fisher effects are far more powerful. @ssumner – “Brent, That’s the liquidity effect. But over time the income and Fisher effects are far more powerful.” Not sure about the income effect, which is ambiguously defined, but on the Fischer effect, it’s actually weaker than you claim, see http://informationtransfereconomics.blogspot.com/2014/09/the-path-of-policy-is-strongly.html (in general) and this post in particular: http://informationtransfereconomics.blogspot.com/2014/09/the-liquidity-effect-and.html (Fisher effect wears off over time). DAVID FRENCH: Hi Scott, it’s David French. I just read your blog post from two days ago, in which you told your readers about the death threats against my children. SCOTT: Oh, sure thing. Least I could do. Bob, You obviously know nothing about the NBA. A Spurs/Warriors matchup doesn’t happen every day. Seriously, There are 1000s of things in the world worse than French’s sad predicament, and I don’t stress out over them either. Do you? I supported Hillary Clinton in 2008 (on the Democratic side; Ron Paul on the GOP side) because I thought she’d be a good president (or at least, a better one than Bush), too. …and now I have to reschedule. You know, sometimes I feel like you don’t really take the time to understand my trolling. Do you want me to stop? Oh wait. No, Scott, I don’t stress out over Trump, or Rosie O’Donnell, or blah blah blah. But I also don’t write blog posts asking my readers to imagine how bad it would be to wake up in an America where Trump won the election (which is what you did 2 days ago). Let me put it like this: Suppose I found a news item where people were stressed out over Keynesianism. If I wrote, “Get a life!” wouldn’t that be weird? Granted, Chris Rock could plausibly write that, but not me. So, when you say you aren’t stressed about this election, when you’ve devoted 40% of your blogging space this year to warning how awful Trump is and how it’s everyone’s moral duty to vote strategically to stop him…it just seems weird when you mock people who are stressed out about the election. Scott, if you need material, you can make fun of this guy for freaking out so much about the election. Last thing Scott: Trolling aside, your hammering away at monetary offset has been really good. Without your efforts on this front, I probably wouldn’t have thought much about headlines like the one you lead this post with. I think you answered your own question. If it is offset, it impacts the multiplier. This isn’t the point. The point is the words that you use are important when speaking to the public. Bob, If I thought my blogging would have helped stop the Rwandan genocide, I would have “obsessed” over it in my blog–non stop. But I wouldn’t have been stressed over it. The article I referred to suggested people were so stressed they were having trouble sleeping, or they were seeing a shrink, That’s what I was making fun of. Sure, I’d find it annoying if Trump won, but that’s all. I blog about this to try to prevent Trump from winning, and also to annoy Trumpista commenters. And because I enjoy making fun of Trump. It’s almost like Ray Lopez is running for president—how often do we get a chance to mock someone who is 100% bad, who has even fewer good qualities than Hitler. rtd, That’s what I’m saying, that it affects the multiplier. who has even fewer good qualities than Hitler. But it’s conditionally zero. Just stick to monetary offset. Christian, Trump has zero good qualities. None. Hitler was a decent artist, a vegetarian, a powerful speaker, and probably had a few other good qualities. Trump has none. He’s not even a good businessman. I’m not saying Trump is worse than Hitler (Hitler was 1000 times worse) I’m saying he had fewer good qualities. rtd, A multiplier is calculated taking into account the responses of all other sectors of the economy. You may not like it, but that’s how economists do things. Hitler did have great taste for music. I can’t help but feel you’re misunderstanding my point which is doubly frustrating because my goal is for you to change your commentary to prevent confusing the public in your writings. I know what a multiplier is and how it is calculated. I also am not disputing a fiscal multiplier may be zero. It’s just that “monetary offset” is a better term, as I’ve stated. That’s all. rdt, I use the term ‘monetary offset’ all the time. Not sure what your point is. Must one always use the same term? Yes, I realize you do. I’m concerned that saying the fiscal multiplier is zero implies that as an absolute. I feel monetary offset is clearer & more “honest”. That’s all. Precisely, because it was clear since day 1 all your posts on Trump were more about virtue signalling than about sincerity.